The desktop calender does not need to be installed, so just delete the downloaded program file! If you do not like, simply move the calendar to the trash! Delete the Desktop.Calendar.Tray.OK.exe or DCT_OK.exe! See also: ► ... Open the program path via the Windows 10 Task Manager! Please always use ... the latest version of Desktop.Calendar.Tray.OK for Windows! Thus, one can test this calendar tool without hesitation, since no installation on Windows is required, and if it does not like, it can delete quite quickly. It is extremely convenient that this simple and easy-to-use desktop calendar does not need to be installed if you place it on the desktop after downloading without installing it. It can be used immediately on all Windows operating systems, just as quickly it is gone if you do not like it, just put it in the trash with it, and the calendar is gone. 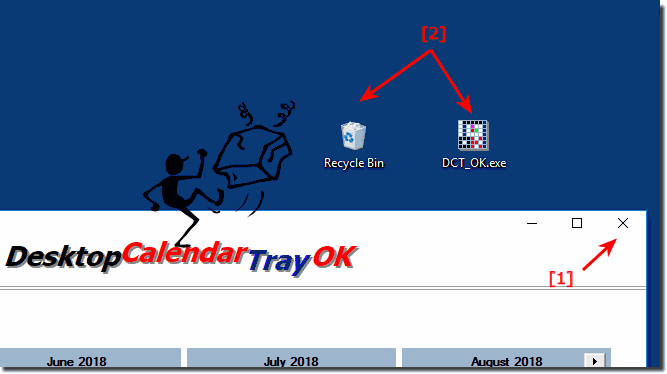 Desktop.Calendar.Tray.OK - FAQ-2: Uninstall Desktop Calendar from the Windows Desktop!